When experts try to describe the smart grid, their favorite analogy is the internet. Just as the internet enabled interactive, two-way communication, the smart grid, we’re told, will deploy sensors and software to digitize a century-old analog electricity distribution system, transforming it into one capable of integrating renewable energy and decentralizing power production. But while the benefits of the internet are manifest — YouTube, Facebook, Grist! — what will the smart grid do for you and me? For most people, the most familiar part of the smart grid is the smart meter, those wireless digital devices being installed in homes by the millions so that residents can monitor electricity use in real time rather than through a monthly utility bill that arrives long after the power has been consumed. A sunnier view of the smart meter as a gateway to a new energy future emerges in Los Angeles, where utility Southern California Edison has built a model home with smart grid technology embedded in everything from the dishwasher to the thermostat. “It’s much easier to show than tell,” says Mindy McDonald, a Southern California Edison project manager. She is standing outside the “Smart Energy Experience” home that’s been constructed inside the utility’s Customer Technology Application Center, just off the 210 freeway in the inland suburb of Irwindale. “Grappling with the smart grid, it’s much easier to just walk people through,” says McDonald. The idea is to show people how smart grid technology can cut their electricity bills, reduce the need to build additional fossil fuel plants, and therefore cut greenhouse gas emissions. A Coda electric car is parked in the stylish suburban ranch’s garage. Solar panels, a solar hot water system, and a wind turbine sit on the roof. LEDs provide the home’s lighting, and every appliance contains communication chips, allowing them to “talk” to each other and to the utility through the smart meter attached to the front of the house. 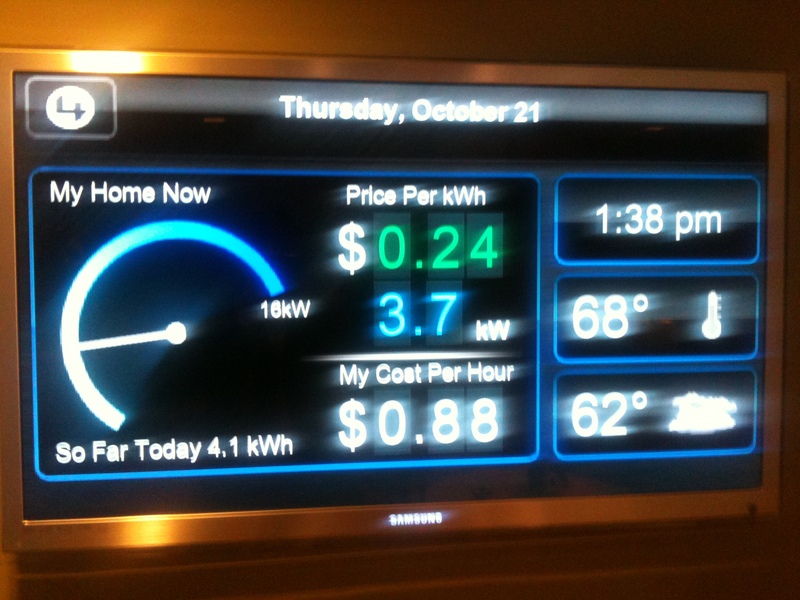 A video screen in the living room displays the home’s energy management system, and a large flat screen in the kitchen tracks the amount of electricity being consumed and its cost. When McDonald turns on the washing machine and the air conditioner and then plugs in the car, an “energy speedometer” on the screen shows the cost of electricity rapidly accelerating from 11 cents an hour to $2.81. The display also tells the homeowner how much electricity has been consumed so far in the day and the price per kilowatt-hour. The utility so far has installed smart meters in about a fifth of the 4.9 million households and businesses it serves. Beginning in January, those customers can set a monthly electricity budget and receive a text alert, email, or phone call when they’re on track to exceed their limit, according to McDonald. Another upcoming program, called Save Power Days, will let customers sign up to have their electricity consumption automatically curtailed when demand — and prices — spike, say on a hot summer afternoon. In return, they could save up to $200 a year on their bills. She touches the iPad that controls the house to show how a smart house would react. When the meter signals the energy management system, it adjusts the thermostats, turns off the air conditioner, and switches on ceiling fans. Window blinds lower to block sunlight and keep the house cooler while the lights are dimmed. Theodore F. Craver, Jr., chief executive of Edison International, the utility’s parent company, said in an interview that these technologies will change people’s relationship with the energy system. The question is just how successful utilities will be at persuading people to become active participants in managing their energy consumption. “Too many of them are saying just giving people more and better information about electricity use, for example, is automatically a huge environmental plus,” Ralph Cavanagh, the co-director of energy programs for the Natural Resources Defense Council, said at the E2 Environmental Entrepreneurs recent conference. They might well start paying more attention when utilities begin introducing what is called “time of day” pricing. Since the smart grid lets utilities monitor electricity consumption in real time, they can start charging consumers higher prices when demand spikes and thus the cost of power rises. In other words, if you set your air conditioner at arctic temperatures when all your neighbors are cranking up their units on a sweltering day, you’ll pay the price. The flip side is that your smart meter could tell your smart washing machine and dishwasher to delay switching on until power prices drop in the evening. The smart grid offers Joe and Josephine Ratepayer other benefits as well. For instance, if a storm knocks out a power line, all the 1,500 homes on a typical Southern California Edison circuit served by that line will lose electricity. The utility usually doesn’t find out about such outages until customers call to complain. It can be hours before a repair crew can be dispatched and the problem located and fixed. As part of its smart grid program, Southern California Edison will be installing sensors on the top of power poles to monitor the circuit. If a line goes down, sensors will reroute power to minimize the number of homes affected by a blackout. The sensors will also notify the utility of the problem and its location and the system will automatically dispatch a repair crew. That means fewer people sitting in the dark.